Correct. I suspect some detective work (or a sneaky-googly-imagey!) was required to come up with the answer. I also would have accepted "Aurora Watching", "Gorky 17: Aurora Watching", or "Soldier Elite: Zero Hour" as correct answers. It's the final game in the "Gorky 17" series ("Gorky 17"/"Odium" being the first, followed by "Gorky 17: Beyond Honor") by Metropolis Software, who are now part of CD Projekt RED, the developers of "The Witcher" games. I played it back when in was first released (as "Aurora Watching"), and, despite some wonky AI and awkward controls, I found it to be a decent stealth game. Correct. I suspect some detective work (or a sneaky-googly-imagey!) was required to come up with the answer. Just some detective mobygames snoop. I never use image search! I will post new game tomorrow. it's an Amiga game maybe around 1994. 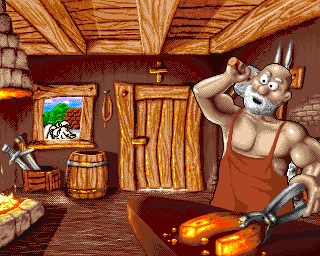 1993, and it was also on PC, but it's Settlers of course, an intro scene. yay I recently read about it, that's why I recognized it instantly. could also be fater than light. Or one of the commander keens. Is there an EGA demake of FTL? Then this! I found it on Google with the FTL tip. It's some sort of Star Trek game... I spy the Enterprise and the Federation logo. I'd have to cheat to know more than that now! So yeah, without cheating all I can say is it's a TREK game! Oh help! Guess it's my turn!